Let's begin by heading north of the border, to that cold place that spawned flapping heads, french fries and gravy and Bryan Adams. Throughout the years, Canada's military force has been on the blunt end of many jokes. The peaceful nation's defenses are rarely taken seriously. Well, here's some more fuel for that fire. 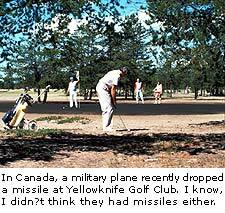 At Yellowknife Golf Club, a military aircraft on approach to Yellowknife airport dropped an unwelcome gift - and no, it wasn't a yellow knife (HA HA). At about 7 a.m. on a recent Friday morning, an air traffic controller noticed something falling from the aircraft. That something turned out to be a live missile, packed with high explosives, a warhead and a rocket motor. The missile struck the sandy ground in the driving range. No one reported injuries, but the course was evacuated. Although the name of the pilot was undisclosed, the other nine guys that comprise the Canadian Air Force were very disappointed in him. 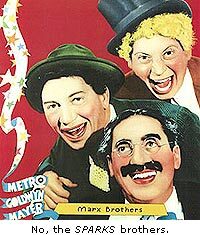 Now onto the Sparks brothers. If you're not familiar with the name, don 't worry. They'll be coming to an episode of "Cops" near you. Patrick James Sparks, 33, and Sean Jerome Sparks, 29, attacked a man named Daryl Emphield, prompting charges of intentionally causing serious injury, reckless conduct endangering a person and criminal damage. Judge David Morrow tossed the Sparks brothers into jail for at least 18 months for the transgressions. Emphield suffered cuts, headaches, stiffness, and gashes to his head and cheek that required stitches. But - as always - that's not all. The Sparks brothers showed contrition after the beating, realizing they beat up the wrong guy. They mistook Emphield for a bitter family enemy. In addition to causing their family 10 years of misery, this mystery harasser was also part of a heated turf war over golf balls. The Sparks brothers, in all their entrepreneurial glory, managed a golf ball scavenging business, in which they recovered balls from the water hazards at local courses and sold them back to the club. The man for whom they mistook Emphield was infringing upon their turf, and beating up Emphield was their response to their enemy's lack of respect. No report on whether alcohol was involved, but authorities have determined that the Sparks brothers were well above the legal limit of stupidity at the time of assault. To Kremmling, Colo., where 19 people participating in a golf tournament might be picking up AM radio stations a little clearer nowadays. As a storm hit, interrupting the tourney, participants retreated to their vehicles to wait it out. Upon believing that the inclement weather had subsided, they headed back out onto the course when a lightning bolt hit. When the smoke cleared, four men were airlifted to Denver hospitals and 15 other participants reported minor injuries. In a statement issued by the Grand County Sheriff's Office, authorities reported that the men were doing well. The event in which the men were playing, called the Kremmling Cliff Classic Golf Tournament, involves knocking golf balls over the edge of a cliff that sits above town. In a related story, the electricity in a Denver-area hospital went out yesterday, only to mysteriously turn back on when four recently admitted patients held hands and feverishly rubbed their feet on a carpeted floor. While we're in the Denver area, we go to local Burlington Northern and Santa Fe Railroad tracks and the scene of a recent crime. Jacob Schwartzkopff, 84, was struck by a train while seeking lost golf balls. The crew of the train, which was traveling at about 15 mph just before the accident, spotted something blue in the tracks. Schwartzkopff, wearing a blue sweater at the time of the accident, began waving his arms upon sight of the train. Schwarzkopff was conscious after the accident and was delivered to Denver Health Medical Center. Police reported to have found a golf ball in the area. The suspect, a Top Flite Hot XL No. 3, has remained silent despite rigorous interrogation. Finally, to end with the biggest golf event in recent memory: this year' s U.S. Open. The final round at Shinnecock Hills, playing to a scoring average of 78.7, which is equal to that of this year's Southampton High Junior Varsity tryouts, had everybody flying off the handle about the unfair course conditions. 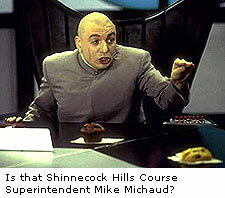 But Course Superintendent Mark Michaud seemed fine with it. After describing the mood of himself and his staff as "elated" following the Open, he continued to say, "Nobody was hanging their head, I'll tell you that." "I didn't want to tick anybody off," Michaud continued as he gently stroked his cat, Mr. Migglesworth, in a darkened room while fits of lightning and thunder continuously erupted outside, "but when you get guys swearing at you, when you get guys who usually don't say anything throwing their clubs, you know you've done your job." Michaud followed his comments with a hearty, spine-tingling guffaw that echoed out of the room, down the hallway and into the ears of the innocent to forever haunt them. And in announcements this week, the J.R. Brewski's first Drive for Life golf tournament will be played on the Fourth of July. Officials involved with the tournament are not sure whether this is actually the first time the event has been played. There have been some reports that the event might have been played last Fourth of July as well, but all involved remain extremely sketchy on the details, although many recall reporting extreme headaches and dehydration on the morning of July 5.